If you love the Imogen Rose Embroidery Bra, style 3804, and the Eternal Side Support Bra, style 3809, we think you will love the Imogen Rose Body Comfort Side Support Bra too. Designed in smooth material with a lace trim and offering good support. Also featuring generous straps for added comfort; adjusted at the back, and hook and eye fastenings to the mesh rear. Finished with a bow to the central gore. Comfy to wear. Great support. Great fit. Great value for the money. Perfect fit. All products are well made. Purchased in sale and represent excellent value. Great bra. Comfortable for all day wear. The actual bra is pretty and fits well however the underwire is very uncomfortable under the arms, not enough padding! This Bra the only one out of 3 bras I bought fit me, the only uncomfortable part is the center where the tiny bow is. Comfortable, brilliantt support and fits perfectly. Stylish, comfortable and value for money, what else can you ask for ? 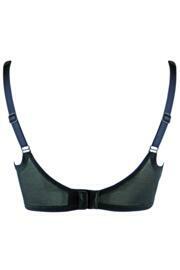 Really pleased with this bra which gives good support and is very comfortable. Bra was very tight, sent this one back. Good value for a buxom lady like me! True to size, good support. Amazing fit & feel - love it.